"Through study the mind is renewed"
The University of Southern Queensland (USQ) is a medium-sized, regional university based in Toowoomba, Queensland, Australia, with four university campuses at Toowoomba, Springfield, Ipswich and Fraser Coast (Hervey Bay). It offers courses in law, health, engineering, the sciences, business, education, and the arts. USQ has been a leader in distance learning by leveraging technology since the 1970s, which has allowed it to serve rural Queensland and international communities through its on campus, off campus, and online programs. :41 In 1998 it was named World’s Best On and Off Campus University by the International Council for Open and Distance Education and was winner of the Australian University of the Year Award in 2000-2001. It operates three research institutes and seven research centres which focus on a wide range of business, agricultural, scientific, environmental, and technological issues. The institution was established in 1967 as the Darling Downs campus of the Queensland Institute of Technology. In 1971, it became the Darling Downs Institute of Advanced Education, then the University College of Southern Queensland in 1990 and finally the University of Southern Queensland in 1992. Queensland Institute of Technology (Darling Downs) opened on 2 February 1967 in Toowoomba. It had 140 foundation students. In 1971, the institute became the Darling Downs Institute of Advanced Education (DDIAE), an autonomous multi-purpose college. DDIAE, managed by its own College Council, began offering distance education in the mid-1970s. By 1980, there were more distance students than those on campus and DDIAE educated 75% of the country's international students in the 1986-1987 school year. From 1980 to 1990, DDIAE grew significantly from 1,000 to 8,000 full-time student equivalents (EFTSL). It became the University College of Southern Queensland (UCSQ) in 1990, under the sponsorship of the University of Queensland. 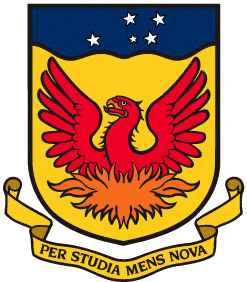 In 1992, the institution became the University of Southern Queensland (USQ) when it gained full university status. USQ was a founding member of the Regional Universities Network that was launched in 2011. USQ was voted the World’s Best On and Off Campus University in 1998 by the International Council for Open and Distance Education (ICDE) The university or USQOnline, its "state-of-the-art" web-based learning platform, was commended by the Australian University Quality Agency as a e-learning international leader, and won the Australian University of the Year Award in 2000-2001. It was the first learning institution to be granted an ISO 9001 Quality System Certificate of Registration in the world. It serves people that are generally under-represented in higher learning institutions. Its student population included part-time working students, people from socioeconomically disadvantaged backgrounds, and from remote and rural areas. USQ's student population includes refugees, Indigenous Australians, and have a periods of interrupted education, who have special needs completing their education. Total student enrolments in 2012 were 27,228, of which 19,976 students studied online/externally. The on-campus enrollments were: 898 at USQ Fraser Coast, 1886 at USQ Springfield, and 4,468 at USQ Toowoomba. It had 1,853 on-campus students and 3,969 external international students in 2012. Based upon the results of the 2013 International student barometer survey, USQ was name the top university for international student satisfaction in Australia that year. In 2014, there were 28,000 students enrolled in among 10 pathway, 76 undergraduate, and 85 postgraduate programs. USQ ensures that, as a regional university, its curriculum serves local and regional employment needs, it engages in regional social and economic development, and serves the regional community. About 4,000 students attend the Toowoomba campus, It is one of Australia's most well-equipped and modern campuses, having Harvard style lecture theatres and syndicate rooms in the School of Business Phoenix Building. In addition to its campus library holdings, it has extensive online databases. The campus has Olympic standard basketball courts, high tech gymnasium equipment, an aerobics center, and netball courts at the Clive Berghofer Rec Center. It has the country's largest, most traditional Japanese garden. Three co-educational residential colleges located on its Toowoomba campus: McGregor, Steele Rudd, and Concannon. Together, they accommodate more than 400 or 450 students. Housing includes meals, internet, phones, and weekly cleaning service. 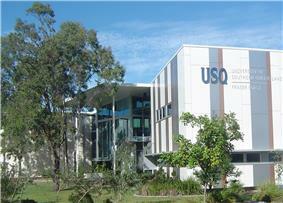 USQ's Fraser Coast campus is located on the Queensland coast at Hervey Bay, about 300 kilometres (190 mi) from Brisbane. There are more than 800 students enrolled at Fraser Coast in accounting, business, commerce and marketing; health, human biology and nursing; community welfare and development and human services; education; and postgraduate work-based learning. The $800,000 library and bookshop opened in 2013. The Campus also features a Student Hub for personal and academic support, computer labs and wireless access, green spaces and cafes. USQ's Springfield campus is located at Springfield, a suburb of approximately 30 kilometres (19 mi) southwest of Brisbane CBD. The campus has an auditorium, on campus accommodation, and a tavern. Phoenix Radio is its online community radio station serves the Greater Ipswich region and also provides training for students enrolled in the Bachelor of Applied Media program. University of Southern Queensland, Ipswich campus. USQ Ipswich is located in the growing region of south east Queensland, 55 minutes from the Brisbane CBD. USQ Ipswich offers degrees in nursing and paramedicine as well as tertiary preparation programs. The Campus features an award winning library complete with a rainforest garden and water feature designed to increase air quality and provide an ideal learning environment. Based on competitive grants won, industry funded research collaborations, and Excellence in Research for Australia (ERA) ratings, USQ has significant and core research strength in the broad area of agriculture and the environment. This core research strength has generated over $10 million in new grant and industry funding during 2010-2012 and is the driver of USQ’s ERA "world class" ratings in Agriculture & Veterinary Science and Physical Sciences. ^ The University of Queensland (UQ) Ipswich Campus was transferred to USQ on 7 January 2015 following an agreement between the two universities. The decision to transfer the Campus was motivated by a desire to increase tertiary education opportunities in the region and to reflect the strategic objectives of each university.